Rare Antique Dorset Owl, Pottery unknown but of typical Dorset style and in good condition from a private collection. These Harvest Bottles were typical of the Dorset region. This one is unusual in that it is made from a redder clay with slight glazing to the upper half. This 'Owl' has typical pinched eyes (lugs) to support the leather thong handle. 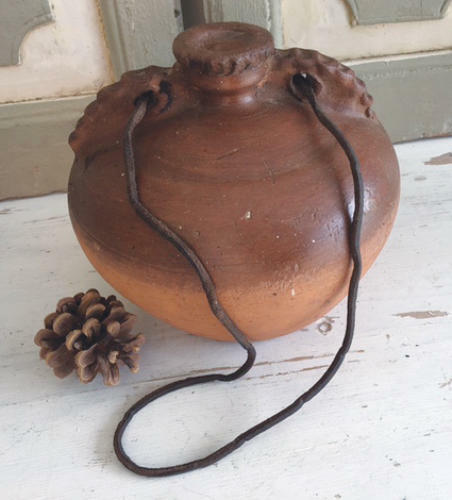 There is no gap between the neck and the lugs as these actually attach to the neck of the jar and with unusually 6 pinch marks leading to the formed spout. Traditionally used to take Cider or Ale into the Dorset countryside during harvest time they were more breakable and less survived unlike the Oak Barrel equivalent. Examples are in the Wimborne museum and further reading can be done in The DORSET COUNTRY POTTERY book by Jo Draper and Penny Copland-Griffiths.